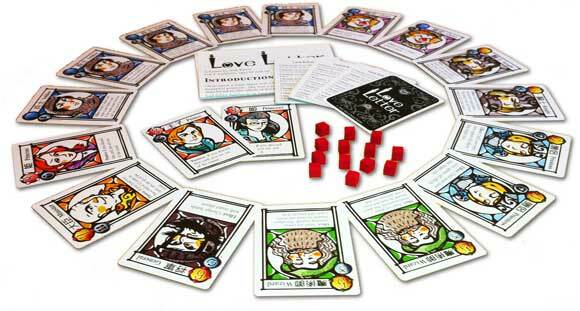 Love Letter Kanai Factory Edition is based on the same rules and cards as the Love Letter Tempest Edition but features the charming art and graphics from the original game first published in Japan. The Kanai Factory Edition is a limited release by AEG and will only be available while supplies last! Do you only have a couple of minutes to play a board game? Play this game, you can play 5 rounds in less than 20 minutes. Do you not have enough room to bring your favorite, yet gigantic, board game? I’m not in love with the theme, which is why I rated the components four stars. However, I LOVE the box, and the quality of the cards and the cubes. Ah, and if at all possible, buy some small wooden hearts to replace the cubes. The cubes are useful, but not at all thematically coherent. I really can’t recommend this game enough! Add a Review for "Love Letter: Kanai Factory Edition"